Chris graduated from The University of Miami, FL in 1996 with her Bachelors of Health Science followed by her Masters in Physical Therapy in 1998. After graduate school, she began treating individuals with sports and orthopedic injuries. Chris first became interested in physical therapy in high school, realizing she wanted a profession where she could make a difference in the quality of people’s lives. While playing Division I Basketball on scholarship at The University of Miami, she witnessed several severe athletic injuries and saw the commitment it took to rehabilitate these injuries so athletes could return to play. Chris experienced rigorous rehabilitation first-hand her sophomore year when she injured her knee and had reconstructive surgery. After eight months, she returned to complete her college basketball career. This experience solidified her desire to become a Physical Therapist. Chris not only played basketball, but she has also run a half marathon, biked 280-miles in three days for charity, and rock climbs several times a week. Chris began working at Sports Rehabilitation Center in 2004 and is now the Clinic Director at the Sport Rehabilitation’s Midtown Clinic. In addition, she is in charge of student affiliations as the Center Coordinator for Clinical Education (CCCE). 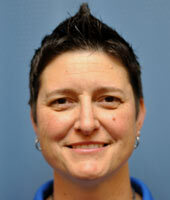 She continues to engage in education and has completed advanced training in dry needling and manual therapy. Chris loves treating motivated patients regardless of their injuries, and her personal and professional desire continues to be giving her patients the best care, so they can reach their goals.